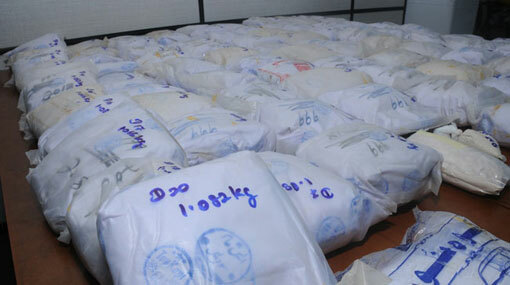 The Colombo Fort Magistrate’s Court has allowed the Police Narcotics Bureau (PNB) to detain and question the 05 suspects arrested with over 95kg of heroin in Kollupita. Accordingly, the PNB will detain the suspects until 29th of January for further questioning. The detention order was issued when the suspects were produced before the Colombo Fort Magistrate today (23). 95kg 88g of heroin was seized in a special joint operation carried out by the PNB and the Special Task Force (STF) officers in Kollupitiya area last morning (22). The officers had first apprehended an American national at the entrance of a supermarket in Kollupitiya along with 1kg 62g of heroin and two Sri Lankans, who had arrived at the location to obtain the said amount of heroin. The police have also seized a luxury car in which the two Sri Lankans had arrived in. While searching the American national, the police had uncovered the key mentioning the name of a luxury apartment building in the area. Accordingly, a raid was conducted in the apartment building and the police managed to seize the rest of the haul hidden inside an apartment on the first floor of the building. Two other suspects were also arrested during this raid. Reportedly, Two American nationals aged 29 and 43 years and a 41-year-old Afghan national are among the suspects.